Amazon do not show button to use PayPal but still there is a way to use PayPal on Amazon. How to Use PayPal on Amazon ? Register fro PayPal debit card by going on PayPal.com by clicking "debit card" tab. 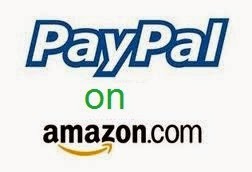 It allows you to purchase items on Amazon even when it do not have PayPal links. You will receive card though mail and then activate it by calling on telephone number given on sticker. As you make payment on Amazon.com, choose debit card and use PayPal Debit Card.